Cruising Lake Taneycomo with Lake Queen or Landing Princess is a perfect way to enjoy a romantic winter vacation in Branson with your loved one. A romantic winter getaway on the lake with the “Main Street Lake Cruises” through Lake Queen or Landing Princess offers couples a wonderful time because they are the only river boats that operate on Lake Taneycomo. They two river boats are special as they both give you a more relaxing form of entertainment during lunch time and a chance to enjoy a scenic journey along the lake while you enjoy delicious meal on board. You will be guided safely along the flowing water of Lake Taneycomo by a certified boat captain as he shares stories about the lake and landmarks you’ll encounter along the way, and the bountiful wildlife that make their home on the beautiful lake. Many people spend their entire lives without experiencing cruising the majestic lake and without knowing where the majestic bald eagle lives. But cruising with any of the river boats, you’ll come upon a shoreline areas inhabited by the bald eagle. Visitors enjoying lake cruising are excited to see these incredible creatures perched in the trees or soaring above the water and the spectacular views that surround the lake are worth the trip. The “Lake Queen” is an authentic recreation of the paddlewheel boats that were once abundant on the White River, which later created a man-made Lake Taneycomo after the construction of the dam. Unlike the old-fashioned river boats, the “Lake Queen” offers a climate-controlled lower deck, restrooms, and an open-air upper deck where you can view completely the beautiful natural scenery that surrounds the lake. Another advantage of lake cruising is by doing little shopping to your day at some of many retail outlets at Branson Landing. Landing Princess is another elegant river boat in Branson that begins its river cruise from Branson Landing waterfront and takes a river journey across Lake Taneycomo. The 100-foot Land Princess has two decks of climate controlled seating area and upper sun deck. This beautiful river boat gives guests the most fashionable and memorable dinner experience onboard the beautiful yacht. In addition to the cozy accommodation of the fashionable yacht, each river journey will also include the commentary of a guide who will give narration about the history and culture of the people in the Ozarks as well as how Branson become famous and evolved into one of the most visited cities today. 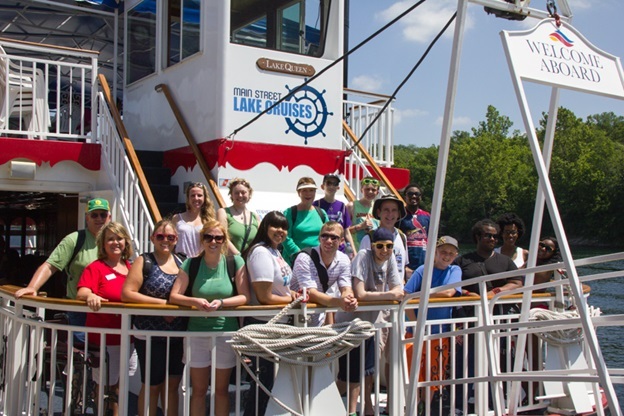 Cruising Lake Taneycomo has never been exciting and entertaining. If you take a river cruise with Landing Princess for an Ozark Mountain River Dinner Cruise, you will enjoy delicious buffet with various Ozark treats like BBQ pulled pork. The elegant buffet aboard the river boat allows you to enjoy a wonderful meal along with the scenic views that surround the lake. A wonderful winter vacation in Branson can be enjoyed best if you take a romantic river cruising with your loved on Lake Taneycomo through Lake Queen or Landing Princess.